Rockville Nights: JUST ARRIVED: FIRST SOFT SHELL CRABS OF 2013 AT AMALFI IN ROCKVILLE! JUST ARRIVED: FIRST SOFT SHELL CRABS OF 2013 AT AMALFI IN ROCKVILLE! 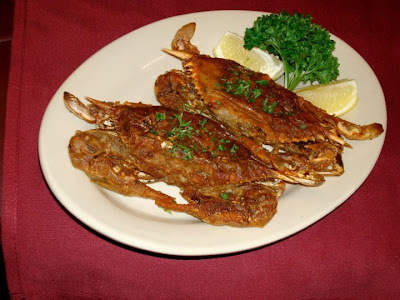 Tonight is the first night soft shell crabs are being served this year at Amalfi Ristorante in Rockville. The restaurant says they should have them through the weekend, but they can go fast. You can always call ahead to reserve a plate, just in case.